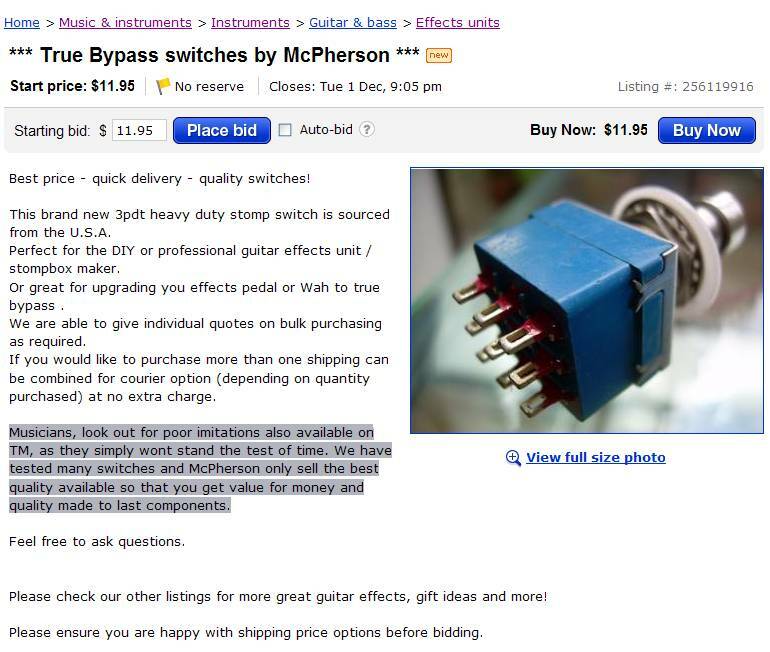 I source my 3PDT switches from John Lewman’s great Effects Connection website and I’ve sold over a hundred of them. Like most of the parts I sell I get these as a personal stock and sell off some locally to stomp box builders and D.I.Y’ers who find it uneconomical to order a single part from the USA. You can also get these locally from Jaycar for $14.50 plus shipping. 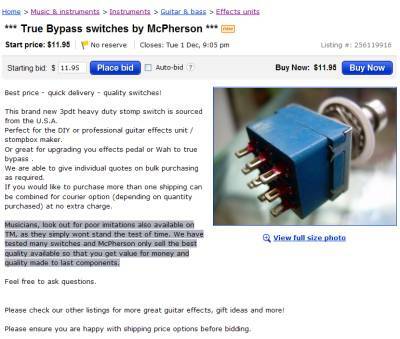 Now as I state elsewhere on the dextermods website I don’t actually buy parts in specifically for resale, but I don’t mind helping out my fellow DIY musicians by sharing a few parts, but I certainly don’t expect to make a living from it. My footswitch listings include an L.E.D and two resistors to complete the job. As always you need to look at the big picture. As far as I know I’m the only other seller of 3PDT foot switches on Trademe. Is this trader really saying that despite selling over a hunded 3PDT fottswitches WITHOUT A SINGLE PROBLEM or return that these are ‘poor imitations’ or is he being dishonest? As I said, my source for these is Effects Connection, where does this seller get his? Probably the same place. Question and Answer might help, but would he answer your questions? I don’t know, but did you see this same sellers auction for that ‘Old Electric Guitar‘ a wee while ago? Check out the questions he left unanswered as bidders went for it on what they might have thought was a Gibson L6-S.
Gibson L6-S or an imitation?